Will it be worth your time? Although it has its moments of goofy fun, Venom doesn’t really know how to build a movie around its title monster; its flirtation with body horror is half-hearted at best, maybe because director Ruben Fleischer (Zombieland) often plays the character for so-so comedy. All told, it resembles one of those confused, indifferently made comic book movies of the early 2000s, like Daredevil or Ghost Rider. Bradley Cooper’s instantly, rapturously acclaimed directorial debut offers a new take on one of Hollywood’s favorite fables, the already twice-remade tale of a waning superstar who ushers a talented young artist into showbiz, all while falling further out of the spotlight himself. Cooper plays the superstar, an alcoholic country-rock veteran named Jackson Maine. Lady Gaga, in a transcendent breakthrough performance, is Ally, the aspiring singer he falls for and takes under his wing. Will it be worth your time? Far from the clumsy vanity project plenty were expecting, A Star Is Born is the work of a born filmmaker; Cooper has a great eye, and he’s smart enough to build this latest remake of the 1937 Technicolor romance around his electric chemistry with Lady Gaga. It’s not a perfect movie—as in most iterations of this story, the rise remains much more gripping than the fall—but it mostly works as a rousing, Americana-inflected crowdpleaser. And the songs, including the recently released “Shallow,” are mostly terrific. Code-switching between the poor neighborhood where her family lives and the posh (and mostly white) private school where she spends much of her time becomes even trickier for Starr (impressive young actor Amandla Stenberg) when she witnesses a brutal police shooting. Her former gang member dad (Russell Hornsby) and academic-conscious mom (Regina Hall) are split about whether she should testify in a grand jury and bring unwanted attention from both police and local drug dealers. This thoughtful and timely young adult drama is adapted from the popular novel by Angie Thomas. Will it be worth your time? The Hate U Give tackles big questions about identity and race while still functioning as a conventionally satisfying coming-of-age film. That’s no small feat, especially for a movie relegated to the often-derided realm of YA adaptations. Eleven years after scoring an Oscar nomination for The Savages, writer-director Tamara Jenkins returns to filmmaking with this semi-autobiographical drama about a Manhattan couple (Kathryn Hahn and Paul Giamatti) going through the years-long ordeal of trying to have a child, either via exhaustive fertility treatments or adoption. A ray of hope—along with a new set of complications—arrives in the form of Sadie (Kayli Carter), the couple’s shiftless, twentysomething stepniece, who comes to stay with them. Will it be worth your time? Although it’s laugh-out-loud funny in spots, Jenkins’ knowing third feature struggles to find a dramatic center for its portrayal of a relationship held together by self-imposed pressure and a lack of fulfillment. Noted neckerchief enthusiast Peter Bogdanovich returns once again to his roots as a critic and cinephile with this documentary about Buster Keaton, the stone-faced master of slapstick stunts. With the help of a range of clips and a large roster of interviewees, The Great Buster offers an affectionate, fast-paced primer on Keaton’s classic films—parodies and dreamlike misadventures in which the silent movie star’s sap heroes were often tripped up by rivals, mistaken identities, self-improvement schemes, and their own delusions. But it doesn’t skimp on the long later part of his career, delving into his work in TV, commercials, and film in the 1950s and ’60s. Will it be worth your time? The Great Buster doesn’t break any new ground. But if it can get someone interested in Keaton, whose jaw-dropping work remains one of a rookie’s best entry points into the rich world of silent film, we’re all for it. Paul Greengrass never met a horrific real-life event that he couldn’t re-create as a queasy, you-are-there docudrama. Cut from the same cloth as his earlier Bloody Sunday, United 93, and Captain Phillips, the similarly procedural 22 July studiously re-creates the events of July 22, 2011, when a right-wing extremist detonated a car bomb in Oslo, then disguised himself as a police officer and stalked and murdered almost 70 teenagers on an island summer camp. Will it be worth your time? Maybe if you’re a glutton for punishment. Predictably, 22 July is a difficult watch, committed as it is to subjecting us to the minute-by-minute horror and tragedy of a terrorist attack on children. That’s a dubious achievement as it is, and Greengrass ends up using it as the mere catalyst for a banal, overlong drama about the aftermath, crosscutting between the defense team of the culprit (Joachim Trier regular Anders Danielsen Lie) and the PTSD of one of the survivors. In other words, it’s a movie that struggles to justify the unpleasant experience of watching it, in theaters or from the comfort of your own home. In his writing and directing debut, Rupert Everett stars as the decadent fin de siècle wit Oscar Wilde—though under the heavy makeup, he looks more like Alfred Molina. Released under the middle-brow imprimatur of Sony Pictures Classics, Everett’s biopic skips back and forth in time as it dramatizes the later life and the public downfall of the famed writer and aesthete: the trial for “gross indecency” that ended with Wilde being sentenced to hard labor, his final years in France, his death. The cast includes Colin Firth as Wilde’s loyal friend Reggie Turner; Colin Morgan as Wilde’s lover, Lord Alfred Douglas; and Emily Watson as the writer’s wife, Constance Lloyd. Will it be worth your time? A diehard Wildean, Everett previously played the writer on stage, in addition to starring in Oliver Parker’s Wilde adaptations An Ideal Husband and The Importance Of Being Earnest; the latter also co-starred Firth. Unsurprisingly, The Happy Prince drew praise for his lead performance when it premiered at this year’s Sundance, though his script and direction seemed to have left critics less impressed. Wait, didn’t the Goosebumps sequel come out a couple weeks ago? No, that was The House With A Clock In Its Walls. For this Amblin-inspired kiddie horror entertainment, Jack Black reprises the role of prolific YA author R.L. Stine, though his conspicuous absence from the trailer—coupled with the fact that he’s not voicing the film’s malevolent marionette villain this time—suggests that it could be more of a cameo than a starring role. Nevertheless, Black is the only returning cast member from the original, with Haunted Halloween entrusting protagonist duties to some new spunky youngsters whose relevant qualifications include appearances in It, Castle Rock, and Jumanji: Welcome To The Jungle. Will it be worth your time? The first Goosebumps more or less abandoned the campfire-stories vibe of Stine’s bestselling source material in favor of harmless but manic family fare of the Night At The Museum variety. The sequel, which appears to simply recycle that movie’s monsters-unleashed plot, will likely offer more of the same—albeit possibly with less of Black’s amusing meta mugging. As in, on the moon. Damien Chazelle chases his Best Director Oscar win with a nuts-and-bolts biopic, casting his La La Land star Ryan Gosling as famously straitlaced American icon Neil Armstrong. First Man traces an eventful decade in the astronaut’s life, from his start at NASA to the one giant leap for mankind, splitting its focus between the dangerous mechanics of the space race and Armstrong’s sometimes tense, distant relationship with his family. Will it be worth your time? Yes. Although Chazelle has seemingly taken a left turn away from his music-movie wheelhouse, First Man’s depiction of the grueling hardships of space exploration—and the preparation for the same—aligns neatly with his ongoing interest in suffering as a path to glory. It’s an expertly crafted, process-oriented biodrama anchored by Gosling’s ability to imply a tempest of emotions raging underneath an almost robotic pokerface. And the climax is remarkable. The last time writer-director Drew Goddard assembled an ensemble featuring Chris Hemsworth to explore an eerie mystery, The Cabin In The Woods became something of an instant classic. His long-awaited follow-up continues the genre-bending, as a singer (Cynthia Erivo), a salesman (Jon Hamm), a priest (Jeff Bridges), a criminal (Dakota Johnson), and a Hemsworth walk into a hotel on the border between Nevada and California. Will it be worth your time? Goddard doesn’t have Joss Whedon writing his zingers this time, and the resulting dialogue isn’t always as clever as it wants to be—a problem in a Tarantino-ish gabfest. On the other hand, both the cast and the needle drops are fun, which means Goddard got at least some of the QT crime-caper equation right. The horrors of addiction are the subject of this ripped-from-reality drama about a father (Steve Carell) struggling to save his teenage son (Timothée Chalamet) from the vice grip of his vice, crystal meth. Uniquely adapted from two memoirs—one by Nic Sheff, the other by David Sheff—the film spans several difficult years in the entwined lives of the authors, dividing its perspective between father and son. It’s the English-language debut of Belgian director Felix Van Groeningen, who made a splash with another kind of tough family drama, The Broken Circle Breakdown. Will it be worth your time? Beautiful Boy is painfully perceptive about the cycles of recovery and relapse, painting the Sheffs’ ordeal in sharp, truthful detail. But the film’s structure, which condenses years of events into pop- and rock-driven montage, doesn’t always serve the committed performances by Carell and especially Chalamet, the latter digging deep a year and change after his breakout role in Call Me By Your Name. In another stab at the Wicker Man folk-horror subgenre, Dan Stevens stars as a wealthy American who goes undercover as a drifter in order to infiltrate the mysterious, island-bound cult that has kidnapped his younger sister. Michael Sheen co-stars as the cult’s leader, Prophet Malcom. Will it be worth your time? It’s the first movie in four years from writer and director Gareth Evans, previously of the in-the-red martial-arts freakout The Raid and its sprawling crime-saga sequel. Here, Evans applies his signature bone-crunching intensity to scenes of medieval-style torture and religious hysteria. It’s an extremely gory, sometimes nonsensical supernatural horror movie. Splitting the difference between real life and The Purge, Ike Barinholtz’s comedy kicks off with an unnamed but familiar-sounding, fascist-leaning presidential administration making a friendly offer to the American people: Why not sign an oath of patriotic loyalty to the current president? (It’s “optional,” but protestors seem to be investigated by a newly formed government agency.) Over the course of the long Thanksgiving weekend, one of the oath’s holdouts (Barinholtz) exasperates his wife (Tiffany Haddish) as he deals with troubling headlines and a visit from his right-leaning family members. The situation escalates from there in ways that students of both comedies and thrillers will recognize. Will it be worth your time? Give Barinholtz credit for tackling something decidedly difficult in his first feature as a director. The Oath feels a little overextended even at 90 minutes, but when it connects with a big laugh or suspenseful cringe, it feels vital in a way that few broad comedies manage. Thunder Road takes its title from the Bruce Springsteen song of the same name, blared at a wake by the deceased’s son, Officer Jim Arnaud (Jim Cummings), who has a mini meltdown while attempting to eulogize his mother. This tragicomic set piece played out in its entirety as its own Sundance-feted short film. Now Cummings, who also wrote and directed, has expanded it into a feature, chronicling an emotionally tumultuous few weeks in the life of a cop wrestling not just with grief but also with the responsibility of raising his daughter after a messy divorce. Will it be worth your time? A sympathetic portrait of an unstable white cop with women issues may be the very definition of playing with fire in 2018. But Thunder Road, which won the Grand Jury Prize at SXSW this year, transcends its questionable logline thanks to Cummings’ remarkable lead performance: a wholly singular portrait of a man constantly perched between his generally polite disposition and a total emotional breakdown. It’s hilarious and affecting in about equal measure. In a remake of a festival favorite by Israeli filmmaker Nadav Lapid, Maggie Gyllenhaal plays a teacher who becomes convinced one of her students is a gifted poet. This sounds like a junior Good Will Hunting; it looks much more ambiguous and discomfiting, as the teacher appears to toe the line between nurturing and dangerous obsession. There’s probably no one better to imbue this kind of character with complexity than Gyllenhaal, who seems naturally drawn to rich characters. Will it be worth your time? Reviews from Sundance praised Gyllenhaal and director Sara Colangelo, and the trailer is elegantly rattling, so maybe this is the rare American remake on par with its predecessor. Michael Myers returns to Haddonfield yet again for the umpteenth sequel to John Carpenter’s 1978 slasher par excellence. His latest rampage, which retcons all entries in the series except the first, comes with a slightly higher pedigree than most. It’s been directed by a real name filmmaker, David Gordon Green, who co-wrote the script with partner-in-goofball-crime Danny McBride. And Jamie Lee Curtis has also reprised the starring role of Laurie Strode, now an elderly survivalist who’s spent her entire life preparing for Myers to break out of his mental-asylum captivity and come back to finish the job he started 40 years earlier. Guess which night they’ve decided to relocate him to a new facility? Will it be worth your time? 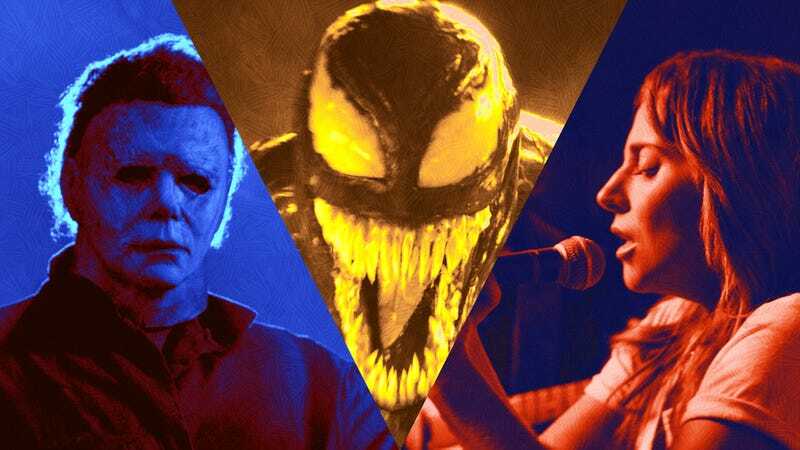 Look, audiences at last month’s Toronto International Film Festival and Fantastic Fest seemed to mostly have a great time at the new Halloween. So what if Green and McBride undercut their scares at every turn with dopey comic relief? Who cares if the style seems as indebted to the Rob Zombie remake as it does to Carpenter’s gold-standard original? And is it even worth mentioning that this series already brought Curtis back to play a trauma-hardened version of Strode, in a sequel that more artfully grappled with the exact same themes? The Shape is back, baby! Just go with it. Real-life writer Lee Israel (Melissa McCarthy) hit a career dead-end in middle age, only to briefly revitalize her bank account (and, at least in her own eyes, her career) by forging and selling letters from literary figures, aided by her mischievous, boozy friend (Richard E. Grant). This juicy but ill-advised deception is chronicled by director Marielle Heller, co-screenwriter Nicole Holofcener (whose own films are always sharply written), and Tony-winning Avenue Q scribe Jeff Whitty. Will it be worth your time? Heller’s debut, The Diary Of A Teenage Girl, was quite good, and McCarthy seems due to explore her dramatic range. Film festival notices have been encouraging for both the filmmaker and her world-famous star. Jonah Hill broke out of the comedic mold pretty definitively with 2011’s Moneyball, but Mid90s, his debut as a writer and director, drives directly into dramatic, coming-of-age territory, with all the nostalgic trappings implied by its title. To be clear, there is still a main character named Fuckshit in this movie, but the overarching focus is on the sometimes-painful adolescence of a group of young men in Los Angeles. The cast is an alluring mix of newcomers and veterans, including official young man of cinema Lucas Hedges, Sacred Deer and son of war Sunny Suljic, and Katherine Waterston as their mother. Will it be worth your time? Hill’s grown increasingly selective and thoughtful in his acting projects, and surrounds himself with talent in front of and behind the camera here. Early notices are positive enough to warrant optimism. A lot of actors making their directorial debut this month, huh? Transporting his signature understatement from one side of the camera to another, Paul Dano helms this 1960s-set domestic drama about a teenage boy (Ed Oxenbould) watching from the sidelines as his parents’ marriage implodes. Jake Gyllenhaal is his father, burning with shame over his inability to hold down a job. Carey Mulligan is his mother, unable to contain her discontent any longer. The source material is a novel by Richard Ford. Will it be worth your time? As with a lot of literary adaptations, it’s hard to shake the feeling that something has been lost in translation with Wildlife, whose primarily observational hero cries out for the psychological window prose can better provide. Dano, nevertheless, has worked with some of the most accomplished filmmakers today, and he seems to have picked up some good habits from them, including a control and restraint uncommon to American indie debuts. And Mulligan has never been better, playing a midcentury housewife struggling to recover her sense of self from the ashes of a smoldering relationship. French actress Mélanie Laurent (a.k.a. Inglourious Basterds’ Shosanna) directed this adaption of a 1980s-set novel by True Detective creator Nic Pizzolatto. Ben Foster plays a New Orleans mob enforcer who flees to his hometown in east Texas after being set up by his boss (Beau Bridges) and takes a teenage prostitute (Elle Fanning) and her younger sister along with him. Will it be worth your time? While Galveston marks Laurent’s English-language debut as director, it’s actually the fourth feature she’s helmed—and our own Mike D’Angelo gave high marks to 2015’s Breathe, the only one of her French films to open theatrically in the United States. Throw in a strong cast and the promise of some Gulf Coast noir flavor, and you’ve got us intrigued. A prizewinner at Sundance, this Danish thriller stars Jakob Cedergren as an emergency dispatcher who takes a call from a woman who says she’s been kidnapped. Yes, that’s the basic premise of the 2013 movie The Call (not to be confused with Kidnap, the other movie where Halle Berry thwarts a kidnapping without standing up)—though, crucially, The Guilty never leaves the confines of the call center, playing with the potential claustrophobia and anxiety of the dispatcher’s point of view. Will it be worth your time? Word of mouth on Gustav Möller’s debut feature has been very good—and we, for one, are always up for an efficient, low-budget, high-concept single-location thriller. Occasionally shooting through the public’s attention is a story about some old Gauguin or Rothko or Pollock painting selling for a few hundred million dollars, after which we all briefly wonder: How did art get so expensive? And who are these lizard people spending a small fortune on it? The Price Of Everything gathers heavyweights from the curation, auction, and collection worlds, as well as the frankly astonished artists creating the stuff, to trace this meteoric rise in art prices. Will it be worth your time? Director Nathaniel Kahn earned the first of two Oscar nominations for his debut documentary My Architect, about his famed father Louis Kahn. The Price Of Everything has a less personal subject matter but could be another absorbing work, at least for those with some tacit interest in the subject matter. An Evening With Beverly Luff Linn will, if nothing else, sate your desire for preposterous costumes: Jemaine Clement, Aubrey Plaza, and Craig Robinson are all decked out in Napoleon Dynamite-style thrift-store detritus. It’s a crackerjack cast for a comedy, here tapping into their shared capacities for violence and mania. Director Jim Hosking previously helmed the gross-out extravaganza The Greasy Strangler, and seems to be working in a similar mode here, assembling another caper that’s as surreal and disturbing as it is screwball. Will it be worth your time? If Hosking’s previous film’s button-pushing novelty appealed to you, by all means, line up for more. Pretty much everyone else can safely avoid it. Lucien Castaing-Taylor and Véréna Paravel made one of the most arresting documentaries of the new millennium with Leviathan, a pure sensory experience which dunked viewers into the murky waters surrounding a commercial fishing vessel. For their latest collaboration, the two lock their camera on an even choppier, more mysterious subject: the mind of a real-life cannibal, a Japanese man who murdered and partially consumed a Dutch student in Paris in the early 1980s, then later immortalized the abhorrent act in a self-published manga. Will it be worth your time? It’s hard to say what an audience is meant to get from Caniba, which doesn’t coax any deep self-reflection or even particularly interesting insight from its talking head, instead simply provoking repulsion from his dispassionate recounting of events while zooming uncomfortably close on his own flesh and his illustrated confession of his crime. It’s a nauseating experience, by design but to what end? Still, anyone looking for something truly disquieting to watch this Halloween now has a nonfiction option, too. The James Bond parody tolerated the world over (to the tune of near-identical $160 million worldwide grosses for the first two films) saunters back into cinemas, as a bumbling and now-retired secret agent (Rowan Atkinson) is pressed back into service when, naturally, no other secret agents are available for a crucial mission. In the rich tradition of former actual Bond girl Rosamund Pike going from Die Another Day to Johnny English Reborn, Olga Kurylenko jumps from Quantum Of Solace to Johnny English Strikes Again, the title of which hints at a late Pink Panther influence. If you’re looking for bright spots, director David Kerr worked on various Mitchell And Webb series in the U.K.
Will it be worth your time? It probably depends on whether you were, say, aware that there was already a sequel to Johnny English back in 2011, or aware that the original Johnny English from 2003 exists at all. Even if you were, this doesn’t look promising. This October’s other highly anticipated reboot of a ’70s horror touchstone takes a much different tack than the new Halloween. Rather than call back to images and moments from his iconic inspiration, director Luca Guadagnino (Call Me By Your Name) builds something entirely new around the bones of the 1977 Suspiria, matching Dario Argento’s approach with a high style all his own. On its most superficial level, the premise is more or less the same: An American ballet student (Dakota Johnson) attends a dance school that’s fallen under unholy influence. Will it be worth your time? At two and a half deliberately paced hours, the new Suspiria is very much an art film, reinterpreting Argento’s classic into an indulgent, lunatic allegory about motherhood, among other things. Our own Katie Rife, a big fan of the original, basically loved the remake, too, calling it “alternately calculatedly subdued and completely batshit crazy,” while praising its imagery and what amounts to a dual performance from Guadagnino regular Tilda Swinton. Two former childhood classmates, aspiring writer Jongsu (Yoo Ah-in) and model Haemi (Jun Jong-seo), reunite in Seoul and fall into a romance. Then Haemi embarks on a trip to Africa, only to return a few weeks later with a new beau: the wealthy and confident Ben (The Walking Dead’s Steven Yeun). What starts as a love triangle of sorts slowly transforms into something more mysterious and sinister in the new film from South Korean director Lee Chang-dong (Poetry, Secret Sunshine), who adapted the script from a short story by Haruki Murakami. Will it be worth your time? Although it didn’t win any prizes from the competition jury, Burning was the most universally celebrated movie at this year’s Cannes Film Festival. And for good reason, as it’s a masterful kind of thriller, subtly tackling issues of class and privilege while syncing our own nagging suspicions and dawning awareness to those of the main character. Yuen, meanwhile, gives one of the performances of the year, creeping far, far away from the perennial nice-guy earnestness of Glenn Rhee. Frederick Wiseman, of Titicut Follies fame, continues his lifelong mission to quietly chronicle every aspect of modern existence. His latest documentary plays fly on the wall in a small, mostly conservative Midwest town, quietly eavesdropping on the people who work in its businesses, go to its schools, attend its churches, etc. This being a Wiseman movie, there are no talking heads or date stamps, just observational (and occasionally revealing) vignettes of ordinary life, presented without commentary but not necessarily without perspective. Will it be worth your time? On principle, Wiseman’s process is more or less beyond reproach; his time-honored habit of just collecting and presenting moments—creating subtle associative meaning from how they’re arranged—is the polar opposite of manipulative. Unfortunately, that approach doesn’t always guarantee the most compelling footage. Monrovia, Indiana, whose lack of any hints of the political climate of 2018 feels like a deliberate omission (and a questionable one), doesn’t dig up huge insights about the American heartland. At least its running time is manageable; two and a half hours counts as brisk by recent Wiseman standards. Adapted from a short story by John Ajvide Lindqvist, the writer of Let The Right One In, Sweden’s genre-bending official selection for next year’s Best Foreign Language Oscar is, by all accounts, a hard movie to describe—a supernatural thriller-slash-fairy-tale that centers on the relationship between a customs officer and a stranger (Eva Melander and Finnish actor Eero Milonoff, both under heavy make-up) who look suspiciously like museum reconstructions of Neanderthals. Will it be worth your time? Will Border be the Geico caveman love story of our dark, subconscious desires? Probably not, but everything we’ve seen and heard has us excited. Plus, this sophomore feature from writer-director Ali Abbasi (Shelley) picked up the top prize at Cannes’ Un Certain Regard competition, which has a reputation for recognizing the unusual and original; previous winners include Dogtooth, Blissfully Yours, and The Death Of Mr. Lazarescu. Back in 1992, three teenage girls made Singapore’s first independent film, a progressive, zero-budget slasher movie. Then the group’s mentor figure, an American high school teacher, stole the raw footage and disappeared for 20 years. The documentary Shirkers, which shares its name with their lost film, finds its director, Sandi Tan, embarking on a cross-continental journey in search of the missing art that’s also a trip into her own past, a valentine to her estranged friends and collaborators, and a tribute to the original Shirkers, in all its DIY glory. Will it be worth your time? Like most of the best essay films, this one feels like a direct portal into the mind of its maker. It’s also just a fascinating, heartbreaking real-life story of creative ambitions squashed in their prime.